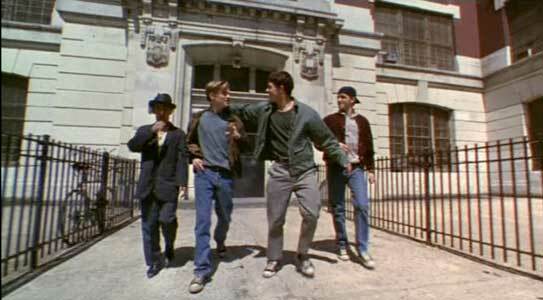 Leonardo DiCaprio, Bruno Kirby, Ernie Hudson and others wear black high top Converse “Chuck Taylor” All Stars in the film. Jim Carroll writes in his notebook between pickup games. The Basketball Diaries is based on an autobiographical book by Jim Carroll who is played in the film by Leonardo DiCaprio. The film focuses on Jim and his friends who are on a basketball team in a Catholic high school in New York City. From the start of the film, the boys demonstrate a totally hedonistic and immoral attitude toward life. They are involved in hard drug use and as they become more addicted, they lose their athletic skills and gradually turn to violent criminal behavior to support their addiction. Carroll’s one redeeming feature in the plot line is that he is an aspiring author, and keeps a diary of his life, even through the most destitute of times and experiences. If only Jim and his friends were just “High on Life”. 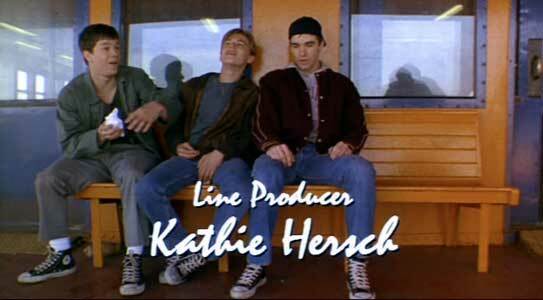 There are great black high top chucks shots throughout much of the film, as DiCaprio and his buddies on the team wear them most of the time. But the story line is progressively more depressing, and it makes you wonder how these kids could enter into such a depraved life style so quickly. After all, they were great athletes and were given a Catholic education in a parochial school. The film never addresses how these young teenagers lost all normal moral values so quickly (and you see this on several levels as the film quickly earns its R rating). If the point of the film is to blame it all on drug use, this is an overly simplistic explanation, and doesn’t explain the boys total lack of any morality, common sense, consideration for others, or even simple dedication to the good of their team. For example, in one scene the team is just about to play a game, and DiCaprio has several pills in his hand. He doesn’t even know what they are, yet he pops a large black one anyway with (of course) totally disastrous consequences. Jim and his buddies walk the streets of New York. 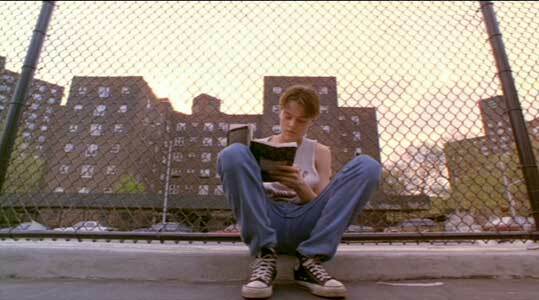 There is also a sad visual analogy in the film: as the teens’ chucks got dirtier in The Basketball Diaries, the mood of the film became more discouraging. Yet somehow Jim survives all of this, suddenly changes his attitude toward life, and breaks his addiction. The implication is made that he did survive because of his stronger desire to be an author. DiCaprio gives a strong performance (and he is great at portraying dysfunctional kids with attitude) but this film still leaves more questions unanswered than answered. Wouldn’t it be much nicer to see a film about the group of New York City kids described in the article by Roger House elsewhere on this site? Jim’s life deteriorates as he becomes addicted to drugs. 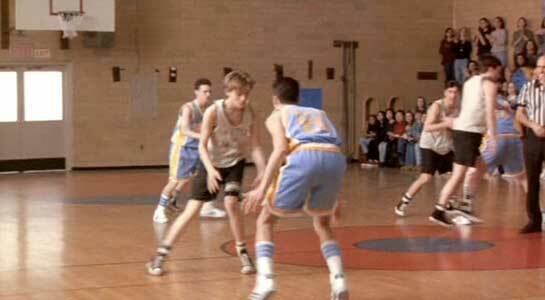 DiCaprio dribbles up the court. 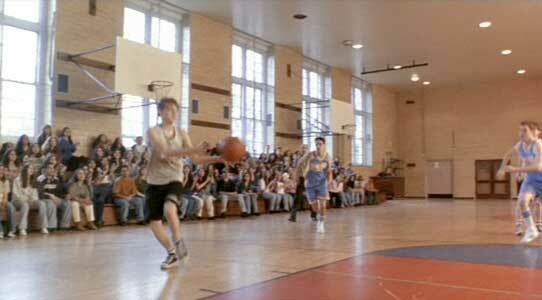 This would have to be when they were actually playing basketball, before the team members got strung out on drugs, crime, and a low lifestyle. There was a game sequence that was shown near the beginning of the film that is probably the best scene. The team was quick and had some great moves. There was also a good one-on-one game scene between Jim (DiCaprio’s character) and an older African-American friend who helped Jim out later after finding him passed out in the snow at the outdoor street court where they had their games. The team was capable of great passes. Later they just passed out. 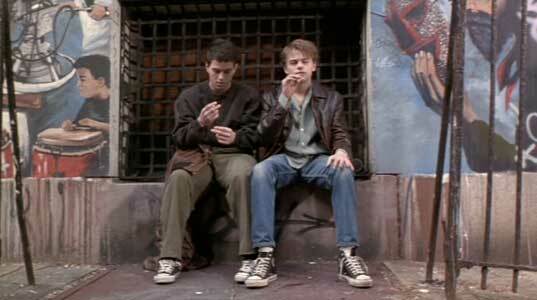 The Basketball Diaries. (1995) Leonardo DiCaprio, Bruno Kirby, Lorraine Bracco, Ernie Hudson. Directed by Scott Kalvert. Categories: Drama, Crime and Mystery, Sports.